Although grilling is often thought of as the great American tradition, most countries enjoy some type of outdoor cooking. In addition, many dishes from other countries can be adapted to the grill or smoker. One of our favorite ethnic themed grill outs would be Mexican. Well, I guess you'd have to call it Mexican-American. The Hispanic population has grown yearly around here, and recipes get shared and then adapted, and we all end up with some good eats. For a Mexican cook out, I like to get a London Broil (which can actually be a variety of different cuts - might want to ask the butcher if he's got one good for grilling). We grill that fairly rare or it will get tough and then cut across the grain in thin strips. The meat is served in burrito wraps (easier to hold than the small soft taco shells) with the usual toppings. Another quick and easy Mexican meal on the grill is Grilled Quesadillas. It really doesn't get much easier. Just watch close and don't burn them. While the main dish is grilling, we stick on a pan of nachos. Grilled nacho chips take, literally, seconds. I used to do those in the oven under the broiler, but I thought: Why not wrap some tin foil over the pan and see how it goes? You can hear the cheese start to sizzle. Pull the pan right off. Those go fast. You may have to make a few pans of them. Now, we've found a great queso dip to heat on the side of the grill. This was not an easy task. Really, I've looked for three or four years trying to find something like the cheese dip my son adores at the local Mexican restaurant. He can eat two bowls of that himself. I tried brand after brand of various quesos and dips and melted different cheeses at home with different seasonings. But, no dice. I could not match his favorite cheese dip from Monterays. I was at Harris Teeter trying out the sushi sample (which I didn't like very much). But, I saw Maggie's White Queso Dip. Hum. It looked the same color as the dip at the restaurant. It's hard to tell when the stuff is cold, but I figured it was worth a try. Hurray! This is THE DIP. It is smooth. It is creamy. It is dreamy. It even got the thumbs up from my son who is quite picky about his queso. 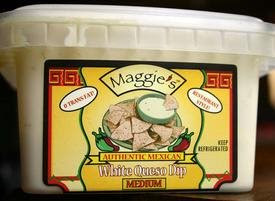 I was curious about this magnificent cheese queso dip so looked around and found that Maggie is from Charleston. She started out with salsa and then added the queso. This lady is the real deal. She grew up in an orphanage her parents ran in Mexico and had 68 brothers and sisters there. That's a lot to feed, and Maggie helped. That's where she learned to make really yummy salsa and queso dip. Maggie was working as an interior decorator, but she decided to try her hand at food. I'm glad she did. She's really great with her products. I'm not sure how broad the market is for Maggie's products. I know they're at some Krogers, Whole Foods, and Harris Teeter here in my town.